Ms. Karen Aldridge-Eason is the first foundation liaison to the governor’s office in the United States. Having served as a program officer at the C.S. Mott Foundation and developed the Office of Foundation Liaison, she offers an unusual perspective on Michigan’s philanthropic infrastructure, and in particular, the work that has been accomplished in public policy and through public-private partnerships. Ms. Karen Aldridge-Eason talks about her career in philanthropy. Ms. Karen Aldridge-Eason talks about the development of Michigan's Office of Foundation Liaison. Ms. Karen Aldridge-Eason talks about the advantages of Michigan's Office of Foundation Liaison, like strong regional associations. Ms. Karen Aldridge-Eason talks about the benefits of looking at the larger picture in public policy. Ms. Karen Aldridge-Eason talks about building relationships and networking in Michigan. Ms. Karen Aldridge-Eason talks about how public policy, at all levels, can affect philanthropic organizations. Ms. Karen Aldridge-Eason graduated in 1980 from the University of Michigan with a Bachelor of Arts in education. She then attended Western Michigan University pursuing a master’s degree in public administration, which she received in 1985. With a pastor for a father, and a mother who worked as a teacher and a principal, service was a fundamental part of Ms. Aldridge-Eason’s childhood. Living in Flint, Michigan, she was also made aware of the work of the Charles Stewart Mott Foundation at a young age. Early in her career, Ms. Aldridge-Eason served as a missionary in western Africa, before returning to Michigan and finding a position in the state government. Ms. Aldridge-Eason experienced many different facets of state government during her early years there. She worked as a legislative assistant in the Michigan Senate before becoming the deputy director of a state department budget office within the executive branch. In 1988, she was given the chance to act as budget director for her hometown of Flint. Thereafter, she returned to the state budget department in 1992. In 1994, Ms. Aldridge-Eason began working for the C.S. Mott Foundation as program director for the newly formed Flint program area. She remained in that position until 2003, when she was “loaned” by the Mott Foundation to become the first foundation liaison for the governor’s office. She was then invited to apply for the position based on her extensive experience in both government and the nonprofit sector. The governor’s Office of Foundation Liaison (OFL) is a novel organization that facilitates relationships and creates opportunities for partnership among foundations, and between foundations and the state government. This organization, which has flourished under the direction of Ms. Aldridge-Eason, is the first of its kind and has since served as a model for similar organizations nationwide. This organization was created in response to the economic downturn in the state of Michigan as a way to increase the efficiency and thoroughness of community support through the nonprofit sector. Since its inception, the OFL has connected more than $100 million from foundations to state initiatives including reforms in K-16 education, economic and workforce development, health, early childhood, and land use (1). The OFL brought together foundations, school leaders, and government officials in a collaborative effort to found the Early Childhood Investment Corporation, which was then instrumental in creating the Office of Great Start. Another success of the OFL has been its involvement with the Michigan College Access Network, where it was able to use foundation grants to leverage matching support from the U.S. Department of Education, equaling $25 million (2). Ms. Aldridge-Eason was also influential as a facilitator when the state created the country’s first nationally funded Prisoner Re-Entry Initiative. This program was a partnership between local and national foundations and the Michigan Department of Corrections, and demonstrated Ms. Aldridge-Eason’s ability to form relationships and build trust between various parties based on their similar goals and initiatives. 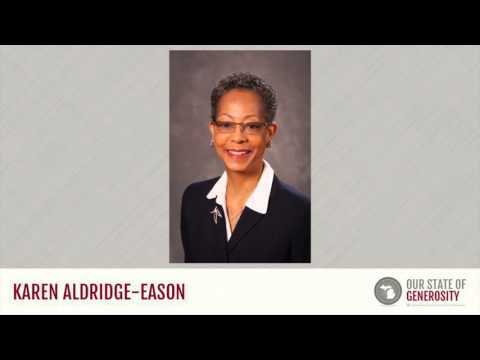 Ms. Aldridge-Eason recently stepped down as the chair for the board of directors at Genesys Health Systems, and continues to serve on the board and as a member of the board of directors at both Altarum Institute and Tapology, Inc., and as a member of the Association of Black Foundation Executives. She has also been affiliated as a member, fellow, treasurer, director, or coordinator with a vast number of nonprofit organizations including, but certainly not limited to, the Michigan Public Health Institute, Michigan Community Service Commission, Baptist World Alliance, Big Brothers/Big Sisters, Flint Youth Service Corp., Flint Young Women’s Christian Association, and the American Society for Public Administration. Ms. Aldridge-Eason was interviewed regarding her insights and experiences in working with Michigan’s philanthropic community and the Our State of Generosity (OSoG) partners. The following are selected quotations from her interview specifically related to the five organizing themes of the OSoG project.